If you got a tablet or eReader over the holidays and want to know how to load it up with free eBooks from the library, let us show you how! You can use one of our help sheets found here. 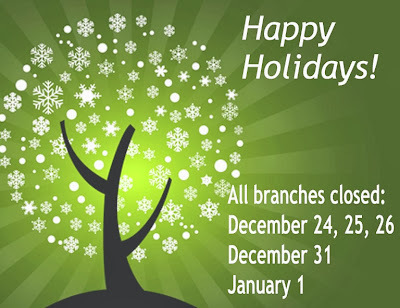 Better yet, call one of our branches to book your personal 1-on-1 help session with one of our tutors. These are free and available until mid-February. Call soon, as these fill-up quickly! If you already know how to use OverDrive, which is where you will find our eBook and audiobook collection, have a look. 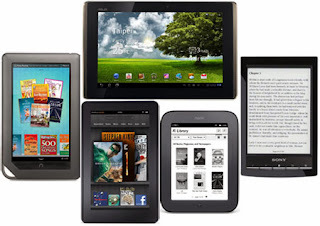 We've added lots of new titles to fill your eReader, tablet, or phone. Just visit this link and download titles right away! And don't forget about the Gutenberg Collection, full of classics that are always available and do not count against your checkout limit. Did the kids get a new tablet this year? Or did you get one that you will let them use? Our Youth Services Librarian has some apps to recommend, and lots of resources for finding free and low-cost educational apps. Just visit this link to find all sorts of suggestions. We will be offering Tablet Time family workshops in the coming months, so keep an eye out for those. You'll learn how to use apps to help your child develop early literacy skills and get ready for school, plus enjoy books and literacy activities. Coming soon to a library near you! Today the blog is on Holiday. We'll be back next week! Connie at our Bridgetown branch baked for the last day of our 2013 “12 days of Cookies”. 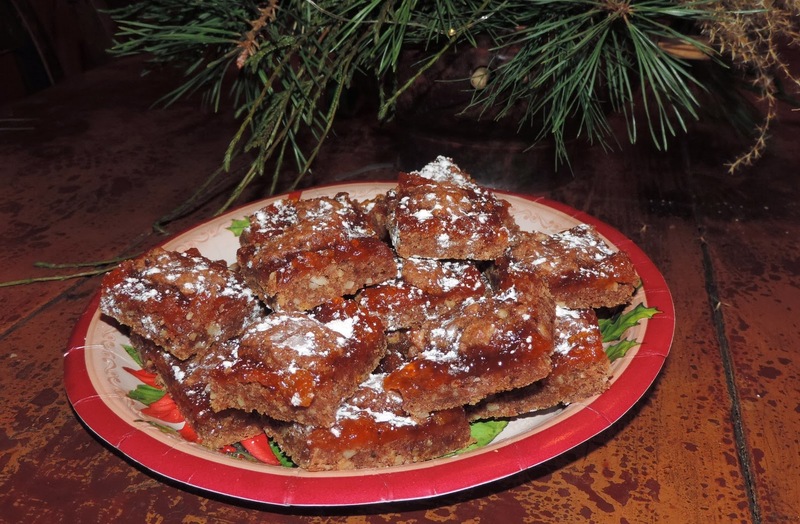 Connie says, “This recipe for Molasses-Ginger Crisps comes from The Christmas Cookie Club by Ann Pearlman. This is not technically a cookbook, it's a gentle, thoughtful novel centered around a group of women who gather together once a year at Christmas and share cookies. Each chapter begins with a particular cookie recipe. The recipe I chose to make features ginger -- one of my favourite flavours! 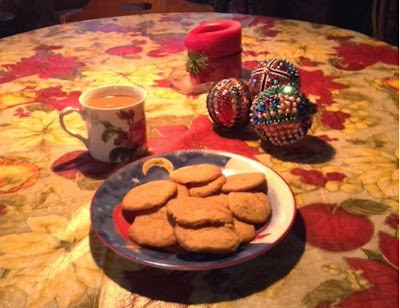 And I was particularly attracted to this recipe because it uses three different forms of ginger: fresh, powdered and crystallized.” Connie’s cookies can be found at the Middleton branch today. Beat butter and sugar together 2 minutes. Add egg and yolk, salt, fresh ginger and crystallized ginger. Use whisk to blend flour, powdered ginger, and baking powder, and add to mixture. Add molasses. Form into logs about 2 inches in diameter and chill a couple of hours (or freeze for a few days). Preheat oven to 350 degrees. Cut the rolls into 1/8 inch slices. Bake for 12 minutes. Makes about 6 1/2 dozen cookies. Ken Maher, from our Annapolis Royal branch baked these little treats, which will be making an appearance at the Berwick Library today. The recipe is from the book Cookies for Christmas by Jennifer Dorland Darling. The traditional raspberry-and-almond flavour combination of the Viennese linzertorte is replaced here by apricots and hazelnuts. 1. Grease and lightly flour an 11 X 7-1/2-inch baking pan; set aside. 2. Place nuts in blender; blend until nuts are finely ground. Stir flour into nut powder and set aside. 3. For batter, in a large mixing bowl beat butter with an electric mixer on medium to high speed for 30 seconds. Add sugar, cocoa powder, cinnamon, cloves and salt. Beat until combined, scraping sides of bowl occasionally. Beat in egg until combined. Beat in as much of the flour-nut mixture as you can with the mixer. Using a wooden spoon, stir in any remaining flour-nut mixture. 4. Evenly spread about 2 cups of the batter into the prepared pan. Spoon apricot preserves over batter to within ½ inch of the edges. Drop remaining batter by spoonfuls over the preserves. 5. Bake in 350-degree oven for 35 to 40 minutes or until a wooden toothpick inserted into the batter comes out clean. Cool completely in pan on a wire rack. Sift powdered sugar over top before cutting into bars. Store in refrigerator or freezer. Makes 15 to 24 bars. Baker's NOTE: I substituted powdered almonds on my first batch, and I sprinkled a few finely-chopped dried apricots on the apricot jam layer.